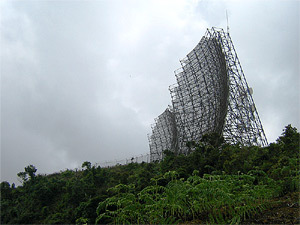 If you’ve ever been to Baguio and looked around at the surrounding mountains, then I’m sure you have already seen the Mickey-Mouse ears pair of radar dishes nestled on a mountain peak to the south of the city. Well, that mountain is called Mt. Cabuyao and those dishes are for tropospheric scatter communications. These dishes were built by the Americans and was meant to link to a similar site in Taiwan and then to Okinawa. Mt. Cabuyao is actually just a child peak of the taller Mt. Sto. Tomas whose peak is located about 2.5 kilometers further to the south and 200 meters higher. Mt. Sto. Tomas is the highest peak nearest to Baguio. As such, the peak has tons of TV and radio masts serving Metro Baguio. As a result we were able to have the Armed Forces of the Philippines acquire the site we selected on Mt. St. Tomas, which we called Cabuyo. The US Army was then allowed to be a tenant on this site. This resulted in a program to improve this link and make improvements in the extension of this system through Taiwan and on to Okinawa. This was known as the Phil-Tai-Oki Troposcatter System. Page Engineers won the contract and they installed two 120-foot troposcatter dishes at Cabuyo. I thought that these dishes had something to do with the weather, but as mentioned above, they are for communication purposes. Now the question that I haven’t found the answer for is whether this site is still operational. Can anyone enlighten us? Update: William in the comments said that his former company took over the dishes back in the 70s and as far as he knows, the site is no longer used for communication purposes. re: the article about the troposcatter antennas on Mr. Cabuyo. I was the site manager at the site in 1970 and 1971. I worked for a company out of Hawaii named Kentron Hawaii, Ltd. We took over the contract from Page in 1970. As far as I know the station has been decommissioned for years. With satelites there is little need for troposcatter systems anymore. Additional on the troposcatter antennas at Mt. Cabuyo, I was also the site manager 1978-80. I personnaly shut down the troposcatter system April, 1978, being replaced by satellite systems as stated by Bill Ellington. Microwave relay was maintained between Clark AFB, Camp John Hay, and Wallace AS. I worked for R.D. Tilbury Inc. Honolulu, HA, at Mt. Cabuyo prior to also working for Kentron Hawaii, Kwajalien, Marshell Islands. Telecom. contractors are a small world it seems. I would like to know how those troposcatter dishes are used and if possible, when did you last use it and for what reason? Could you enlighten me on this matter? In 1963 I was an Army Major recently assigned to Washington. My first assignment was to find out why two Army tropo scatter systems were not working and to recommend a solution. One of these systems was from Clark Air Force Base to Taiwan. At the time I was very well experienced in Tropo Scatter since I had conceived and engendered the Japan Tropo System four years earlier. I determined that the Philippine site had to be at an elevated location with a clear view toward Taiwan. A preliminary analyses indicated that the perfect location was a site on Mt St Tomas near Baguio. It took a year to get this project approved and funded. I returned in 1964 and with help from the Armed Forces of the Philippines (AFP)) and Page Engineers we made a site survey to the Baguio area. We went to the top of Mt St Tomas where the AFP had a small radio relay facility. Unfortunately the top of the mountain was so small it was not suitable for our new facility. We were very disappointed. As we came down the mountain we saw a field that had a clear view toward Taiwan and had an area large enough for our 150 ft antennas and buildings. During the next year the project was approved, funded and installed. Those dishes are still there 37 years after they were decomissioned. Is there any reason for this?